As a father of five children, my heart breaks every time I hear or read about the brutal death of any child, Palestinian or Israeli, Muslim, Jewish, Christian, or of any background. A child represents innocence, joy, and mercy. When Israel imposes, for more than three years, a complete siege on the Gaza population of 1.5 million and turns it into a large ghetto or prison, it certainly harms children. When HAMAS responds to that siege by sending primitive home-made rockets into Israel, it surely endangers children. When Israel carries out collective punishment on the Palestinians by dropping tons of huge missiles and bombs into densely populated residential areas, it most definitely kills children. So far, close to 30 children have died as a result of these bombs and hundreds more have been maimed and disabled. Every time an Israeli child is harmed, the whole world mourns, and rightly so. The whole world is informed of that child’s name, his or her parents’ agony, and the tragic circumstances that caused this death. However, when a Palestinian child is harmed, no one in the world seems to care. No one is told of his or her name. No one is informed about the pain of the parents, siblings, and grand parents who loved him or her. The zionist propaganda machine has succeeded in dehumanizing Palestinians. Palestinians are portrayed as terrorists, murderers, radicals, or sub-humans. That way, it becomes much easier not to care about such a people, no matter how many of them are turned into refugees, how many of their homes are demolished, how much of their land is confiscated, how many of them are imprisoned, and how many of them are killed or wounded. The Palestinian people, the indigenous people of historic Palestine (today’s Israel and Palestine) are, like all people, a nation that wants freedom on its own land. And they have continuously shown the world their willingness to sacrifice everything they have to live with freedom and dignity. And, yes, dead Palestinian children (as well as living ones) have names and their parents love them too. Below are the photos and names of a few Palestinian children killed in the last few days. Haya and Lama Hamdan killed by an Israeli missile. Haya Hamdan finally put to rest (probably not in the way her parents envisioned). 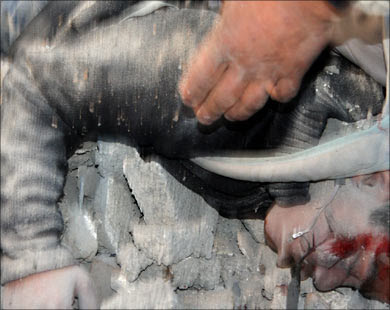 Little boy, Yahya Hayek, under rubbles. Our U.S. government recently supplied Israel with a fresh supply of heavy-duty missiles called bunker busters. It seems the Bush administration wanted to assist Israel in the humane and swift killing of Palestinian children without prolonging their pain. Yahya Hayek’s grandmother was asked to identify the body of her grandson. He was among the fortunate ones whose body was still identifiable. She will send her thank you note to the Israeli leaders for their kind and humane gesture. A father weeps the death of his five daughters, including a 14-month-old toddler. What’s Deena thinking now? Her beautfil angelic face tells a million story. Is she wondering why the world allowed Israel to starve her and her four sisters for three years and then watched as the F-16 sent the missiles to take their lives? Deena can finally rest in peace in her own piece of land. This must be the peace that Israel keeps talking about. A young Palestinian man carries a little boy who died before making it to the hospital. I am sure he has a name too. I am sure he has, or had, parents who loved him too. It might come as a surprise to many Israelis, but Palestinian parents name their children and love them too. His crime is that he is not Israeli; so no one would care. 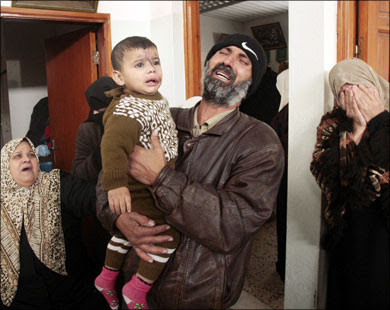 Three killed boys; three less targets for Israel. 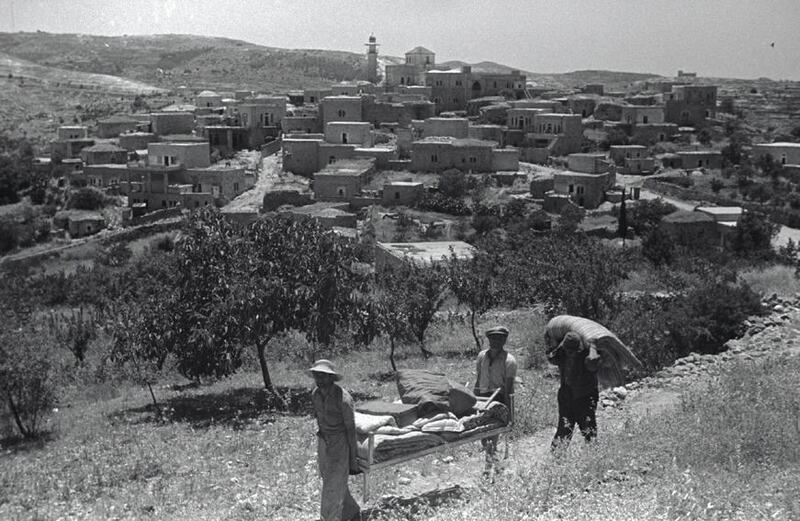 General view of al-Maliha (Jerusalem) taken soon after Nakba, and in the foreground Israeli Jews looting Palestinian properties. While living my childhood in occupied Palestine, I witnessed unexplainable negative emotions (often in the forms hatred and anger) from Israelis, many of whom were young soldiers humiliating Palestinians daily whenever they can. I always knew there is more to it than just the normal hatred or anger between enemies. However, I could not understand what’s the source of this abnormal hatred and anger? Frankly, I thought that we Palestinians should be angrier, not the Israelis, after all Israelis are the ones who dispossessed and thrown us out of our homeland; not the other way around. Years passed, I immigrated to the United States, and I was in touch with more Zionists (Jews and non-Jews alike). Overtime, I developed a theory for this unprecedented negative emotions, which I like to share with you in this small article. Briefly, I believe the source of this negative emotions is deeply irrational, and its core is very emotional. The more I researched the Zionists movement (especially from its founders), the more I found that the vast majority of Jews (especially before WWII) were not Zionists and many thought it will be dangerous to Jews, which explains why over 99% of the emigrating European Jews preferred America over the “Jewish state” to be in British occupied Palestine! However, the Holocaust was a deeply traumatic experience which shocked the Western Jews who survived the genocide. As a result, the extreme and the fringe in Jewish politics became the mainstream, and the “Never Again” slogan was born. For the average Westerner, this slogan may not sound harsh; after all European Jews suffered European anti-Semitism for centuries. On the other hand, to us, the Palestinian people, this slogan implies “Never Again” regardless of the price; “Never Again” even if others become the victim, “Never Again” period. This slogan carries behind it deep negative emotions, which is rarely analyzed or debated; it is a taboo to discuss. Many Western Jews felt betrayed by their respective nations who persecuted them for centuries, and many of these nations openly collaborated with Nazi Germany, who often handed their Jewish citizens to the SS. This was deeply a traumatic and a very humiliating experience not only to European Jews, but also to the European nations (no exception) who witnessed the genocide and at minimum turned their heads the other way. Those who survived the Holocaust found in the Zionist ideology their salvation. Zionism gave them the feeling of empowerment where Jews and Jews alone (no gentile or Goyim) must be the masters of their own future, and they promised themselves never to be the victim again. Consequently, I believe this is the moment when the Spartan Jew was born and the “Never Again” slogan became its moral facade. When Israelis strikes at Palestinians; they are not only sending messages to Palestinians, they are not only retaliating against Palestinian violence, they’re also sending messages to their deprived self-esteem (for lack of a better term) and to the rest of the world that the Jew will not be the victim again. From my experience, rarely you rationally can discuss the conflict with neither a Jew nor a Westerner without the memories of the Holocaust being so close behind; I always felt those memories even when not a word of the Holocaust was mentioned; simply it is there, simply it cannot be discussed. That is the primary reason why discussing this conflict with many Jews and Westerners is very frustrating; you want to discuss the real issues (dispossession, ethnic cleansing, & colonization), but you can’t. Sadly, the emotional barriers are so great to overcome, especially when those emotional barriers cannot be discussed. Often in such discussions, the Palestinian is painted as the anti-Semitic, and Palestinian resistance to Israeli war crimes becomes “terrorism“. Sometimes I wonder why the West is scared of confronting this emotional barrier? Could it because this barrier masks the way Westerners treated their Jewish citizens for centuries? Could it be that discussing this particular problem will open a Pandora’s Box? I don’t know if I am right or wrong, however, I am certain that this emotional barrier should be studied further; I believe this taboo contains few of the important keys that are essential to resolving this conflict. This analysis explains why often many Israelis believe that: Arabs understand only the Language of Force; as if the Language of Force knows how to discriminate between an Arab and a non-Arab! This racist and derogatory slogan (often repeated openly by Israeli leaders) gives the Spartan Jew the moral green light to respond as he wishes to Palestinian violence, and as a result also he compensates for his deprived self-esteem. In that respect, the Spartan Jew sees no Palestinian resistance to Israeli war crimes, he sees only Palestinian “terrorism“! 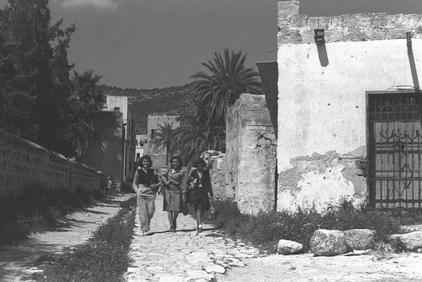 Newly arrived Bulgarian Jewish colonizers living the in recently ethnically cleansed Palestinian village of al-Bassa (1950), click here to find more how the indigenous population left their homes. Some of you may say: Palestinians also carry negative emotions (hatred and anger as well), however, in my opinion the source of these emotions isn’t the same; the source in the case of Palestinians is more rational than emotional. Palestinians have been dispossessed and ethnically cleansed of their homes, farms, and businesses so they make way for the persecuted European Jews, and now they see alien colonizers living in their looted homes, and tilting their fields which they’ve farmed for generations. From my experience, this is a deeply emotional and a very humiliating experience as well. It should be noted that Palestinians directly deal with this traumatic event by directly confronting their oppressor, and they clinch to whatever is unique in their national identity (i.e. art, food, literature, folklore, customs, dresses, history, …etc.). Finally, I wish to tell every Westerner and a Jew reading this article how this conflict has little to do with religious differences; this conflict would have been the same even if other Arabs dispossessed Palestinians. We Palestinians don’t wish to become anybody’s psychological experiment; we don’t want to become a make me feel good pill, we don’t wish to become anybody’s punching bag. We Palestinians don’t wish to become anybody’s messiah, and definitely we don’t wish to be crossed for somebody else’s sins. Sincerely, I wish Palestine was a commodity that can be bought and sold; I would have sold it. I could be one of the few Palestinians who actually empathizes with Jewish suffering, however, my homeland is so dear to give, no human can do that! For us Palestinians, Palestine is not only our homeland, Palestine is our identity; Palestine is the intoxication of our memories; Palestine is the Jewel of all Jewels. My homeland, Palestine, isn’t for sale. Have you ever seen such logic? Perhaps you did if you were around 60 years ago in Eastern Europe….. The article the above quote came from can be read HERE. The cabinet is reconvening to discuss a French proposal for a 48-hour “humanitarian” cease-fire, after failing late Tuesday night to reach a decision. The cabinet is also reportedly discussing whether to expand the Israel Defense Forces operation in the Gaza Strip. Tuesday’s meeting followed a day in which a Hamas rocket struck Be’er Sheva for the first time and the Israel Defense Forces completed preparations for a possible ground operation in the Gaza Strip. The Education Ministry announced that schools in Be’er Sheva would not open Wednesday. In discussions with Prime Minister Ehud Olmert and Foreign Minister Tzipi Livni on Tuesday, Defense Minister Ehud Barak recommended seeking an exit from the fighting within the next few days, using one of the various international initiatives currently being worked on. Barak also favors the French proposal for a 48-hour truce that would be used to examine Hamas’ willingness to agree to a long-term cease-fire, in addition to its stated purpose of providing humanitarian assistance to Gaza’s population. Olmert and Livni are said to be less enthusiastic about the French proposal. When Olmert visited IDF Southern Command headquarters in Be’er Sheva Tuesday, most of the senior officers with whom he met urged him to authorize a ground operation. People at the meeting said their impression was that Olmert agreed. Moreover, even a temporary cease-fire is liable to take some time to arrange, and during this time, ongoing fire and further casualties could spark renewed escalation. IDF troops have been massed along the Gaza border awaiting a ground operation for two days already, exposing them to rocket and mortar fire. And on Monday, a mortar shell killed a soldier at the Nahal Oz base. In addition, the bad weather provides cover for Hamas rocket-launching crews, because it is hard for Israeli aircraft to spot them through the clouds. Palestinians had fired more than 50 rockets at Israel as of Tuesday evening, lightly wounding two Israelis. For the first time, a Katyusha rocket hit Be’er Sheva, 37 kilometers from Gaza. Ofakim and Rahat, both 25 kilometers from Gaza, also suffered their first Katyusha strikes Tuesday. The air force and navy bombed dozens of targets in Gaza, including smuggling tunnels along the Gaza-Egypt border, and 40 Palestinians were killed, including at least five civilians. In addition, Barak sought cabinet approval for calling up another 2,510 reservists, on top of the 6,700 called up on Sunday. The Prime Minister’s Office and defense officials also worked on finalizing Israel’s terms for a permanent cease-fire. These include a complete cessation of all rocket and mortar fire from Gaza by all Palestinian organizations; a ban on armed men approaching the border fence with Israel, since there were several incidents near the fence during the six-month truce that collapsed this month; complete Israeli control over the Gaza border crossings; Egyptian efforts to stop the weapons smuggling into Gaza from the Sinai Peninsula; and some kind of supervisory mechanism to ensure that Hamas is meeting its commitments. A cease-fire will not be conditioned on the return of kidnapped soldier Gilad Shalit, but Israel hopes a truce deal would increase the chances of concluding a prisoner exchange with Hamas. International efforts to broker a cease-fire gathered steam Tuesday as well. U.S. Secretary of State Condoleezza Rice telephoned her counterparts around the world, including a conference call with UN Secretary General Ban Ki-moon, Russian Foreign Minister Sergei Lavrov, French Foreign Minister Bernard Kouchner and European Union foreign policy chief Javier Solana. In addition, Turkey, France and the UN all urged Syrian President Bashar Assad to use his influence to get Khaled Meshal, the Damascus-based head of Hamas’ political bureau, to agree to a truce. So far, Assad has refused, saying Israel must first halt its operation in Gaza. But Turkish Prime Minister Recep Tayyip Erdogan plans to visit Damascus Wednesday to continue this effort, along with Qatari Prime Minister Hamad al-Thani, with whom Erdogan met in Ankara Tuesday. Erdogan will then proceed to Jordan, Saudi Arabia and Egypt. Later Wednesday, Arab League foreign ministers will meet in Cairo to discuss the situation in Gaza. 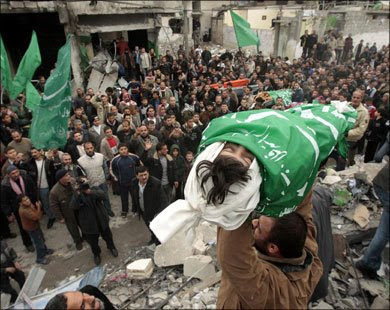 Palestinians carry the body of 4-year-old Lama Hamdan during her funeral in the town of Beit Hanoun in the northern Gaza Strip December 30, 2008. 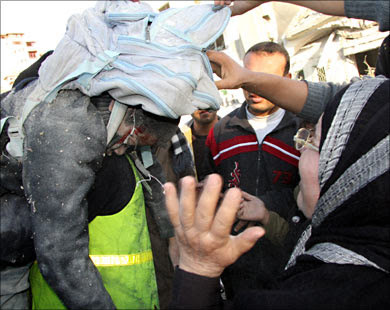 Gaza Strip, 30 Dec, 2008- Israeli air force still launching the heaviest bombardments in Gaza ever. The fourth day of Israeli military operation started with heavy bombings took place west of Gaza City in addition to killing 2 children and around 10 in various places in Gaza to raise death toll to 390 while wounded people up to 1 thousand and 700 most of them civilians. The Israeli announced decapitation strategy of targeting Hamas movement and avoiding civilians clearly unveiled. The F16s targeted a group of governmental building using tons of explosion resulting in killing at least 4 Palestinians. The bombings lasted for 30 minutes echoed across Gaza City causing great trauma and panic for civilians. Total damage stormed the buildings while partially destroyed some neighboring populated buildings. Israeli warplanes, drones, artillery machines, and apache helicopters broadly took part in the nightly raids. Israeli air raids destroyed a sport club and a building inside the Islamic University of Gaza IUG. IUG was hit Monday night and 2 building were destroyed. One of the destroyed building was the laboratory funded by Islamic Development Bank estimated of millions of dollars. The bombings continued for the whole night in separated areas in Gaza Strip. Many civic targets were bombs including mosques in Khanyonis City. Old man was killed in south of Gaza in Rafah City. A run-Hamas police station was hit in El Burej refugee camp mid of Gaza and another one in Bait lahia. The naval forces participated in bombing Gaza destroying many buildings and premises on the coastal areas. Information office I linked to Popular Resistance Committees based in a residential building was hit and medical sources reported some that some people wounded in the raid. A boat sailing from Cyrprus to Gaza loaded with 3 tons of medical aids was not far away from Israeli army fire. The boat was hit despite it was not loaded with weapons for Hamas which is clearly deflate the Israeli propaganda. The boat was exposed to fire of Israeli naval gunboats and partial damage took place in the body of the boat. The relief boat still in the territorial waters and it’s seeking a seaport to anchor. On the midday of Tuesday, a new phase of the military operation started. F16s started to break the sound barrier of Gaza. Raids of sonic bombs occurred causing a trauma and panic atmosphere across Gaza residents. The death toll has reached 390 with more than 1,700 injured, 2 hundreds are in critical conditions while there is a severe shortages in medicines. Medical sources announced a collapse in medical sector and Gaza hospitals. Muhamad El Khozndar a doctor at Al Sehfa’ hospital said on a local radio station that Gaza hospitals are no longer working properly. Bandaging stuff, medical tools, medical machines and general cleaning unavailable at the hospitals. Additionally, windows of the hospitals crashed due to a nearby bombings hit a mosque. The early hours of Tuesday night witnessed a set of Israeli missiles west of Gaza City. Medical reports said a number of injured arrived to Al shifa’ hospital including some casualties. Many tanks shelled the norther eastern area of Gaza City. It’s remarkable that humanitarian stage in Gaza is totally collapsed and disastrous as aspects life vanished. All oil derivatives of fuel, gasoline and cocking gas unavailable in Gaza due to a siege imposed two years ago. Bread, milk, rice, sugar, cooking oil are not available and what is inside Gaza is limited quantities stored at homes. 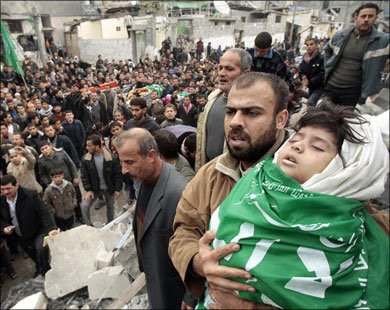 *Casualties of Israeli heavy bombings reached 360 while wounded rise up to 1800 persons, a big number of them civilians. Around 200 in critical conditions and they are exposed to slow death due to lack of medicines. *Israel started the day with 20 heavy missiles of F16s. The bombardments targeted governmental offices and damaged some houses nearby. The sound of bombings echoed in all Gaza city resulting in a panic status and trauma for children. 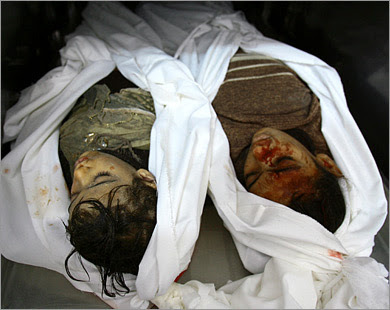 *Two siblings aged 4 and 11 years killed in Israeli air raid north of Gaza town of Bait Lahia. *Two Israelis killed in Palestinian homemade rockets. Israel has been savaging an entire people by imposing a Nazi-like siege upon them on no other account than to punish them for electing a government that both Israel and her guardian-ally, the United States, didn’t like. Demonstrations against Israel’s slaughter in Gaza have been/are taking place in every major city in the United States and throughout the world. People of conscience are standing up and speaking out…. but where are their governments? There have been a few ‘verbal condemnations’ but no action whatsoever. Have the tentacles of the evil Lobby reached out across the oceans? Is the world afraid of Israel? Where is the UN? Where is the EU?? We all know where President elect Obama is, he’s out playing with his golf balls today. Is he too afraid to speak out against these atrocities? Is he afraid that by doing so the ‘charges’ against him being a Muslim might pop up again? And what about the leaders of the Arab world? Even those that do not recognise Israel have been silent….. what’s that all about?? Israel has proven by these latest actions that it is not a civilised nation. It is not worthy of having the support of anyone in the world community. Calls must be made to all elected official urging them to support a move to recall all representatives from Israel’s soil. All of Israel’s representatives must be asked to leave their host countries immediately. Israel must be removed from the United Nations. It has proven umpteen times that it has no regard for that body by rejecting every resolution ever passed against them. All goods made in Israel must be boycotted. All companies having dealings with Israel must be boycotted. Israel must be completely isolated, only then will it realise that it cannot continue in this zioholocaust they have created. Only you can make this a reality. Abu Salah’s family lives in Gaza’s Nasser neighborhood – close enough to hear the bombings targeting the home next to that of Hamas Prime Minister Ismail Haniyeh in the Shati refugee camp, and close enough to hear the attacks on Haniyeh’s office, which also hit the UN building. At 1 o’clock that same night, on the other side of the Strip in Rafah’s Yibna refugee camp, a missile was fired at the home of Riad al-Attar, a senior commander in the Iz al-Din al-Qassam Brigades. Attar had already vacated the building along with his family. Shortly afterwards, another missile was fired, this one hitting a building full of occupants, 300 meters from al-Attar’s home. The home, little more than concrete and asbestos, belongs to the Abbasi family. The father, Ziad, is a building contractor. Three of his children were killed in the strike and remained buried under the rubble: Sadki, age 3; Ahmed, age 12 and Mohammed, age 14. The parents and three other children were wounded. On Monday at 5 P.M. a house was bombed in Beit Lahia, and according to initial reports seven family members were killed. “Every parent understands the home isn’t safe, as the streets aren’t safe,” says Umm Basel. Everyone sees the images on television of young children being rescued from the wreckage. “When I turn on the generator and for a moment don’t pay attention to them, the kids run to the TV to see the girls of the Balousha family,” she said, referring to the Jabalya family which lost five girls and in which four siblings and the parents were injured. All of the windows in the home are open so that the explosions don’t shatter the glass and wound the people inside – at least, that is the case in homes in which the window panes remain whole. Glass panes are impossible to come by in the Strip, and instead people cover the windows with plastic sheets. Such sheets, like window panes, are not among the products Israel has allowed into the territory over the past two years, and they can only be transferred via underground tunnels. Now, with the tunnels’ closure, a shortage of sheets is expected. On top of everything else, Gazans must now deal with the bitter cold in their homes, lacking electricity most of the time, as well as diesel fuel and gas. On Monday and the day before, Rafah residents living close to the Egyptian border were told to leave their homes. On Saturday night, Egyptian authorities gave members of the Palestinian National Guard a message from Israel to move 300 meters from the border because shelling was about to begin. Hundreds of people went to stay with relatives in the center of Rafah, gathering their belongings and leaving for the hundredth time in their lives. Zionist Hasbara operatives have been claiming that the current Israeli genocidal onslaught in Gaza is a “war against Hamas” and that it was only necessitated by the firing of Palestinian rockets on Israel. Israel has been saying ad nauseam that it ended its occupation of Gaza. Well, why does Israel then retain its control of Gaza skies, Gaza shores, Gaza sea, Gaza border crossings (even with Egypt). Why does Israel retain its control of Gaza life? Why? Hence, the issue of firing “rockets” on Israel (they are homemade projectiles that make more noise than damage), should be viewed largely as a red herring. Effectively, Israel has been giving Palestinians in Gaza either of two choices, to die of starvation as a result of the blockade or be exterminated by the Israeli war machine. Indeed, these so-called “rockets” are nothing more than a desperate outcry for justice, for lifting the deadly blockade. Gaza has simply been reduced to a modern-day Auschwitz. The only difference is that Jews are now playing the role of the SS. Hamas did meticulously observe a six-month ceasefire, despite the persistence of the Nazi-like blockade which very much resembled the Ghetto Warsaw siege in 1942-43. 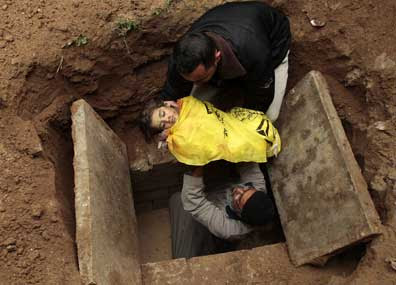 However, Israel on 13 November, Israel carried out a foray into Gaza, killing 6 people. More to the point, Israel killed 49 Palestinians during the ceasefire. Not a single Israeli was killed. 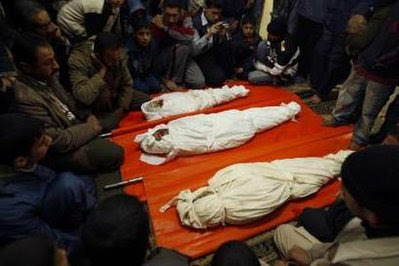 Besides, hundreds of Palestinians have perished because Israel would not allow them to access medical care or medicine. I saw many Palestinians die an agonizing death because the “light upon the nations” wouldn’t allow them to reach hospital a few blocks away. In short, we are talking about a Judeo-Nazi state. I am saying this because when Jews think, behave and act like Nazis, they become Nazis. We must call the spade a spade, especially when it happens to be in the hands of our gravediggers. Therefore, it is a big lie to call this war a war against Hamas. This is a Nazi-like war of extermination against the people of Palestine. If the war were against Hamas, as the war criminals of Tel Aviv keep claiming, Israel wouldn’t have targeted market places, drug stores, college buildings, private homes, mosques, cultural institutions, roads, businesses, etc. Only a state with a Hitlerian mindset would target an entire society and then claim that it is fighting Hamas! It is simply a big lie. So, Israel is simply carrying out a real genocide…and an indiscriminate one for that matter. so. Fortunately, no one aboard the ship has yet been seriously injured. the background before all contact was lost with the Dignity. the Dignity and endangering the lives of its passengers! large dredgers. This is his fourth trip to Gaza. Gaza to report on the ongoing military onslaught. Gaza to do human rights monitoring and reporting..
Ekaterini is a well-known and respected freelance journalist in Cyprus. She is traveling to Gaza to report on the conflict. volunteer in hospitals and clinics. in Gaza to do human rights monitoring and reporting. Martha is a senior research fellow and experienced human rights activist. report on the ongoing military onslaught. relief efforts, and volunteer in hospitals. Scenes from yesterday’s demo in New York City….. All united against the ‘zioblitzkrieg’ in Gaza. Army Radio reported Monday that captive Israeli soldier Gilad Shalit had been wounded in one of the IAF raids on the Gaza Strip, quoting an unnamed Hamas source as saying that the organization intended to safeguard him. It said Hamas sources had confirmed an Egyptian television report on that Shalit, kidnapped in Israeli territory outside the Strip in June, 2006 by Hamas and other militant Palestinian groups, was injured. But there was no word on his condition, or how he was wounded. Vice Premier Haim Ramon told the radio Monday that while he did not know if the report were accurate, he was “convinced that from Hamas’ standpoint, Shalit is a bargaining chip which in the end will bring about the release of hundreds of Palestinian prisoners. Unnamed Israeli officials were quogted as saying that it was possible that the report represented an attempt to use psychological warfare on Israel. Amira Hass and Gideon Levy join those in the human race that condemn the actions of those destroying it. To those of my readers that still might have a problem differentiating Jews from zionists, here are but two examples of the difference. Not all Jews are supporters of the evils of zionism…. please remember that in your comments. It is not Palestine that is the enemy of Israel, it is zionism itself. At 3:19 P.M. Sunday, the sound of an incoming missile could be heard over the telephone. And then another, along with the children’s cries of fear. In Gaza City’s Tel al-Hawa neighborhood, high-rise apartment buildings are crowded close together, with dozens of children in every building, hundreds in every block. Their father, B., informs me that smoke is rising from his neighbor’s house and ends the call. An hour later, he tells me that two apartments were hit. One was empty; he does not know who lives there. The other, which suffered casualties, belongs to a member of a rocket-launching cell, but no one senior or important. At noon Sunday, the Israel Air Force bombed a compound belonging to Gaza’s National Security Service. It houses Gaza City’s main prison. Three prisoners were killed. Two were apparently Fatah members; the third was convicted of collaborating with Israel. Hamas had evacuated most of the Gaza Strip’s other prisons, but thought this jail would be safe. Three members of one neighboring family were killed, all young men in their twenties. None of them owned arms or ammunition; they were simply walking down the street when the IAF bombed a passing car. Another neighbor lost a 16-year-old daughter, and her sister was seriously wounded. The IAF had bombed a building that formerly housed the Palestinian Authority’s Preventive Security Service, and their school was located next door. S. saw the results of some of Saturday’s bombings when he visited a friend whose office is located near Gaza City’s police headquarters. One person killed in that attack was Hassan Abu Shnab, the eldest son of former senior Hamas official Ismail Abu Shnab. The elder Abu Shnab, whom Israel assassinated five years ago, was one of the first Hamas politicians to speak in favor of a two-state solution. Hassan worked as a clerk at the local university and played in the police band for fun. He was performing at a police graduation ceremony on Saturday when the bomb struck. In the interim, the loftiness of peace was on the tip of the tongue of Ehud Olmert, a man who uttered some of the most courageous words ever said by a prime minister. The loftiness of peace on the tip of his tongue, and two fruitless wars in his sheath. Joining him is his defense minister, Ehud Barak, the leader of the so-called left-wing party, who plays the role of senior accomplice to the crime. Israel did not exhaust the diplomatic processes before embarking yesterday on another dreadful campaign of killing and ruin. The Qassams that rained down on the communities near Gaza turned intolerable, even though they did not sow death. But the response to them needs to be fundamentally different: diplomatic efforts to restore the cease-fire – the same one that was initially breached, one should remember, by Israel when it unnecessarily bombed a tunnel – and then, if those efforts fail, a measured, gradual military response. But no. It’s all or nothing. The IDF launched a war yesterday whose end, as usual, is hoping someone watches over us. Blood will now flow like water. Besieged and impoverished Gaza, the city of refugees, will pay the main price. But blood will also be unnecessarily spilled on our side. In its foolishness, Hamas brought this on itself and on its people, but this does not excuse Israel’s overreaction. Israel also proves that it has not internalized the lessons of the previous war. Once again, this war was preceded by a frighteningly uniform public dialogue in which only one voice was heard – that which called for striking, destroying, starving and killing, that which incited and prodded for the commission of war crimes. In another week or two, those same pundits who called for blows and more blows will compete among themselves in leveling criticism at this war. And once again this will be gravely late. The pictures that flooded television screens around the world yesterday showed a parade of corpses and wounded being loaded into and unloaded from the trunks of private cars that transported them to the only hospital in Gaza worthy of being called a hospital. Perhaps we once again need to remember that we are dealing with a wretched, battered strip of land, most of whose population consists of the children of refugees who have endured inhumane tribulations. For two and a half years, they have been caged and ostracized by the whole world. The line of thinking that states that through war we will gain new allies in the Strip; that abusing the population and killing its sons will sear this into their consciousness; and that a military operation would suffice in toppling an entrenched regime and thus replace it with another one friendlier to us is no more than lunacy. Hezbollah was not weakened as a result of the Second Lebanon War; to the contrary. Hamas will not be weakened due to the Gaza war; to the contrary. In a short time, after the parade of corpses and wounded ends, we will arrive at a fresh cease-fire, as occurred after Lebanon, exactly like the one that could have been forged without this superfluous war. In the meantime, let us now let the IDF win, as they say. A hero against the weak, it bombed dozens of targets from the air yesterday, and the pictures of blood and fire are designed to show Israelis, Arabs and the entire world that the neighborhood bully’s strength has yet to wane. When the bully is on a rampage, nobody can stop him. Even worse is Hosni Mubarak…. The pornographic mass slaughter perpetrated by Israel in the Gaza Strip on Saturday, 27 December, once again reveals the Nazi nature of the Zionist state. It also underscore the genocidal nature and brutal ugliness of the Zionist mentality, a mentality based on and shaped by murder, bullying, coercion, aggression, brutality and criminality. Furthermore, it shows that Israel is capable, both mentally and physically, of carrying out a real holocaust against the Palestinian people and other peoples of the Middle East. In fact, it is quite safe to say that there are no moral restrictions that would prevent Israel from committing the unthinkable, namely a campaign of extermination against the Palestinian people. Zionism is simply Jewish Nazism, pure and simple, and the Israeli army is in fact “the” Jewish Wehrmacht. Jews may not like the comparisons, but the Nazi reality of Israel is as conspicuous as the sun in a bright day. Undoubtedly, this is the message that governments and leaders all over the Arab-Muslim Middle East ought to understand and internalize. It is brief and simple: If you are not powerful enough to deter the Nazis of our time, you will be attacked, enslaved and even annihilated. For the Judeo-Nazis, e.g. the Israeli state, the Palestinians are nothing more than “a test case” which would be applied later to Turks, Iranians and, of course, other Arab peoples in the region. In short, the writing is on the wall, and if Muslims and Arabs don’t possess sufficient physical power to deter the expansionistic whims of the Judeo Nazis, what is happening to the Palestinians in Gaza will happen to them, perhaps sooner than many people think. Far-fetched? Well, don’t be too sure. In 1948, Zionist leaders told the world that all they wanted was a small shelter that would protect Jews from another possible holocaust. Today, the “small shelter” has grown into a wild Nazi-like power that is committing a virtual holocaust against the unprotected the Palestinian people. Well, the murderous onslaught against unprotected and thoroughly starved people in the besieged Gaza Strip is a cowardly act of immense proportions. What else can be said of F-16 fighter aircraft and Apache Helicopters being used to rain death and havoc unto unprotected and unfortified police headquarters? Israel often argues that refraining from killing innocent people represents Christian, not Jewish morality, as many Israeli leaders have said ad nauseam. Well, if so, then this should a clear Jewish vindication of all the crimes that the Nazis perpetrated against Jews and non-Jews several decades ago. Besides, even in war there is proportionality, a principle that Israel has ignored rather wantonly by killing dozens or hundreds of mostly innocent Palestinians and Lebanese as a reprisal for the death of a Jewish soldier or settler. Israel says its enemy is Hamas, not the Palestinian people. This is a big lie that is meant to gain the sympathy of the western world, given the success of Zionist hasbara, through the Jewish-controlled media in Europe and North America, in demonizing the Palestinian Islamic liberation movement. Otherwise, why would Israel blockade and starve and savage millions of Palestinians who have nothing to do with Hamas.? We are talking about ordinary people, people who struggle to make ends meet, people who toil from sunrise to sunset to put food on the table for their children. It is mostly these people who are being killed and maimed and starved by the Judeo-Nazi entity. The Black Saturday massacre, which by no means will be the last, is a damning proof that Israel can only survive by shedding blood. Without shedding blood, without threatening its neighbors, without killing their children and destroying their homes, without tormenting and savaging them, Israel wouldn’t be Israel. It would be some entirely different. Israel is simply a cancer upon humanity. If you don’t eradicate it, it will eradicate you. This is the harsh fact the people of the Middle East must come to terms with, hopefully before it is too late. Although the executive mass murderer, Israel non the less shouldn’t be held solely responsible for the genocidal carnage in Gaza. Treacherous Arab regimes are also guilty of giving Israel the impression that it can murder Palestinians at will without having to worry about any negative ramifications from the Arab world. It is really lamentable that powerful states such as Egypt and Saudi Arabia appear so timid and so powerless in the face of the Judeo Nazi state that they appear completely impotent. We all know that tens of billions of dollars’ worth of modern arms have been purchased to protect Arab interests. So, where are the Arab armies? Where are the Arab air forces? Where is the Arab dignity? To be sure, the Palestinians have long given up on Arab regimes and don’t expect these regimes to protect them or fight on their behalf. For in the final analysis, a regime that has no good for its own people, can’t be expected to defend the Palestinians or fight for their just cause. In fact, all that the Palestinians want from these regimes is to stop colluding and conspiring with Israel against them. Is that asking for too much? But the real message ought to be conveyed to the Arab masses, not the regimes that are conspicuously morally, politically and even humanly bankrupt. The Arab masses have a religious and moral duty to depose these hateful despots whose main job has been to torment and savage their peoples on behalf of the United States and Israel. Otherwise, the Arabs will continue to move from bad to worse as they have been ever since the downfall of the Ottoman state following the First World War. God simply doesn’t change the condition of a people unless they are willing to change it themselves. Here they were again – the “first nighters, those who are ready to get out and demonstrate against a new war in its first hours, when war propaganda pours out of all the media and all the parties, from the extreme Right to Meretz, support the war. No organization called for the demonstration – but more than a thousand men and women gathered spontaneously in order to protest in front of the Ministry of Defense in Tel-Aviv, only a few hours after the murderous Air Force attack on the Gaza strip started. They were members of the divers peace organizations, from “Gush shalom” and the “Women’s Coalition for Peace” to the “Anarchists Against the Wall” and Hadash. The police, apparently afraid that the protesters would storm the building in which the Minister and the Army High Command were conducting the war, took special precautions: the elite police commando unit was backed by mounted police. Reserves were hidden in side streets. At the beginning of the demonstration, some of the police confronted the crowd with loaded and pointed guns. “Barak,Barak, Minister of Defense – How many children have you murdered today?” shouted the protesters, whose slogans were backed up by drums. They were especially incensed by the Meretz Party statement the day before, which justified an attack on Gaza, and shouted: “Meretz, Meretz Party – Again for a War?” In the conversations among the protesters, the latest article of the writer Amos Oz, who has been awarded several peace and literature prizes, was mentioned. The article, which justified the military attack, was published at the head of the first page of the mass-circulation daily Yediot Aharonot. The protesters marched from the Cinemateque Square to the ministry. A day before the war, Gush Shalom activists took part in a smaller demonstration which took place in the heart of Tel-Aviv, in order to warn against the attack. This action was not reported in any of the Israeli media. Never to forget….. Never to forgive! I selected the following photos to sum up all that can be said to describe the Israeli massacre in Gaza today and what we expect to see very soon. Palestinians in the Occupied West Bank went demonstrating against the Israel terrorist crimes in Gaza and attacked Israeli terrorists with stones. Reports indicated that all fractions between political parties vanished during these demonstrations, which included Hamas and Fatah supporters who attacked Israel’s terrorist army side by side. And finally, Palestinian President, Mr. Mahmoud Abbas was drinking Arabian coffee in Riyadh, Saudi Arabia. Enjoy it Mr. President! More than 230 Palestinians were killed and several hundred others injured Saturday when Israeli warplanes and combat helicopters carried out massive aerial bombing attacks targeting numerous police and security-related buildings throughout the Gaza Strip. Palestinian officials and spokespersons in both Gaza and the West Bank used epithets such “carnage,” “massacres,” and “war of extermination” to describe the deadly Israeli raids. The intensity of the bombing, say Gaza citizens, were unprecedented in living memory. The attacks began around noon Saturday during the rush hour when as many as a hundred F-16 war planes and attack helicopters launched air-to-ground missiles on numerous buildings in the Gaza Strip, causing widespread death and destruction. The Palestinians, both in the Gaza Strip and West Bank, are firmly under Israeli military occupation and have no army or air-force and can barely put up a token resistance to the Israeli occupation army, one of the largest in the world. Israeli War Minister Ehud Barak threatened to broaden and deepen the scope of the bombings in Gaza “if necessary.” He blamed Hamas for the rampant bombings, saying that Israel had the right to defend and protect its citizens. Like other Israeli officials, Barak ignored the 2-year-old Nazi-like blockade of the Gaza Strip which pushed the 1.5 million Palestinian in the coastal enclave to the edge of a humanitarian catastrophe. One of the deadliest raid targeted a police graduation ceremony in downtown Gaza, killing and maiming dozens of cadets. The fact that the graduation ceremony had been allowed to proceed as scheduled may indicate that Hamas was taken by surprise. Black smoke was bellowing from as many as 30 buildings targeted by the Israeli air force as headless bodies were strewn around the bombed buildings. Some of the bombed facilities were later bombed again, apparently to wreak more death on civilian and rescue teams. The targets of the massive aerial bombings were mostly police stations and headquarters of law-enforcing agencies. Rescue sources said that the death toll as of 6:00 pm Saturday reached 210 with more than 450 people injured, some quite badly. The same sources said the number of casualties was likely to rise as additional victims were still buried under the rubble and unaccounted for. Among the martyrs were Gaza police chief Tawfiq Jabbre and Ismael Ja’abari, a local security chief. Hasanin said 200 people were killed and as many as 300 others were injured. According to Hasanin, 70 of the martyrs were badly burned and mutilated beyond recognition. He added that some of the victims were still buried under the rubble of destroyed buildings. Hasanin said that 120 people injured in the bombings were in serious to critical condition. He called on friendly states and organizations to extend urgently-needed medical assistance to save lives. 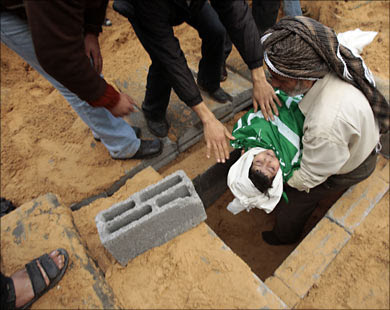 Many of the victims were hastily buried because Gaza hospital morgues were filled to capacity. 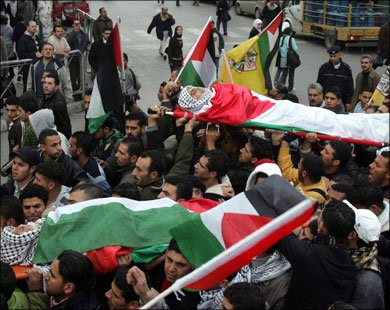 Palestinians in the Occupied territories and in Israel reacted angrily to the wanton killings in the Gaza Strip. A three-day period of national mourning was announced in the West Bank. More over, thousands of people took to the streets, demanding immediate stoppage of the Zionist aggression and calling for the immediate restoration of Palestinian national unity. In al-Khalil (Hebron) in the southern West Bank, hundreds of youths hurled stones on Israeli occupation soldiers at the Bab el Zawiya neighborhood. Several boys were reportedly injured by rubber-coated bullets and stun grenades. Similarly, hundreds of youngsters hurled stones at an Israeli army outpost north of Ramallah. A number of boys were also reported injured by rubber bullets. Palestinian security forces dispersed the protesters before returning to their nearby barracks. At the official level, while most PA officials condemned the “criminal onslaught,” at least publicly, some PA leaders voiced a certain degree of satisfaction at the devastating raids on Gaza. “We promise you that the Palestinian legitimacy will return soon to Gaza,” Abdul Rahim said during an interview with the Fatah-run Palestine TV. Moreover, the Fatah organization sent a circular to its regional chapters asking them to refrain from showing any sign of public gloating over the Israeli bombing in Gaza. Meanwhile, Hamas officials have accused the Egyptian leadership of colluding with Israel against the movement. “Today we pay the price of the Arab collusion with Israel. These massacres wouldn’t have occurred had it not been for official Arab silence and European and American acquiescence with Israel. Egyptian officials sought to fend off criticisms, arguing that Egypt sought but failed to stop the Israeli aggression. Egyptian Foreign Minister Ahmed Abul Gheit said Egypt had asked Hamas to take precautionary measures but apparently failed to do so. Arab commentators were particularly infuriated by the failure of Abul Gheit to challenge the bellicose remarks uttered by visiting Israeli Foreign Minister Tzipi Livni in Cairo on Thursday. Livni said during a joint press conference with Abul Gheit that Israel would destroy Hamas and change the reality in Gaza. However, Abul Gheit remained silent, refusing to challenge the Israeli minister. “This is not the first massacre and certainly won’t be the last. We are talking about a state that doesn’t believe in peace and doesn’t believe in negotiations. It is a state that follows a racist and Nazi-like policy based on physical extermination and ethnic cleansing. “We say to the United States and Europe, this Nazi entity is anti-peace and anti-humanity. 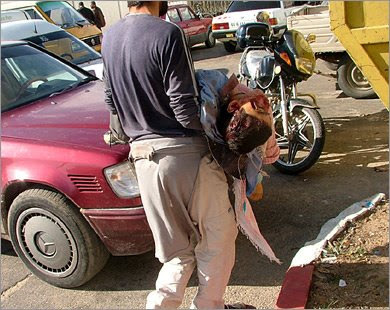 There can be no peace with these barbarians,” said Qaddumi in an interview with the al-Jazeera Tv. Several Arab commentators accused Egypt and the American-backed Palestinian authority of having tacitly encouraged Israel to carry out the bombing campaign against Hamas in the hope that this would eventually allow the Israeli-backed Fatah organization to re-conquer the Gaza Strip. The death toll of “Black Saturday” is the highest Palestinians have incurred since the 1967 Arab-Israeli war. COLD BLOODED MURDER WITNESSED BY THE SILENT WORLD…..